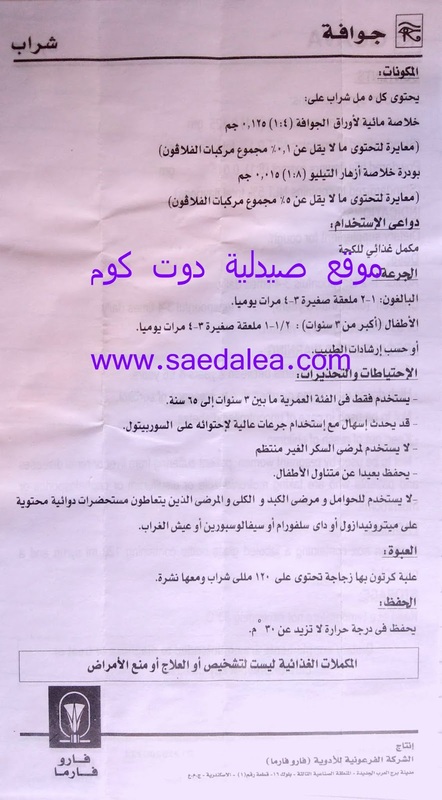 ۱-۲ ملعقة صغيرة 3-4 مرات يوميا. ۱ / ۲-۱ ملعقة صغيرة 3-4 مرات يوميا. أو حسب إرشادات الطبيب. يستخدم فقط في الفئة العمرية ما بين 3 سنوات إلى 65 سنة. - قد يحدث إسهال مع استخدام جرعات عالية لإحتوائه على السوربيتول. لا يستخدم للحوامل و مرضى الكبد و الكلى والمرضى الذين يتعاطون مستحضرات دوائية محتوية على ميترونيدازول أو دای سلفورام أو سيفالوسبورين أو عيش الغراب. علبة كرتون بها زجاجة تحتوى على ۱۲۰ مللى شراب ومعها نشرة. يحفظ في درجة حرارة لا تزيد عن 30 م. CONTENTS: Each 5 ml syrup contains: Aqueous guava leaves extract (4:1) 0.125 gm (Standardized to contains NLT 0.1% total flavones) Powdered tilia flowers extract (8:1) 0.015 gm (Standardized to contains NLT 5% total flavones) INDICATIONS: Dietary supplement for cough. Dose: Adults: 1-2 teaspoonfuls 3-4 times daily. Children (older than 3 years) : /2 - 1 teaspoonful 3-4 times daily. Or as directed by the physician. PRECAUTIONS & WARNING:- To be used only for patients between 3 years & 65 years. 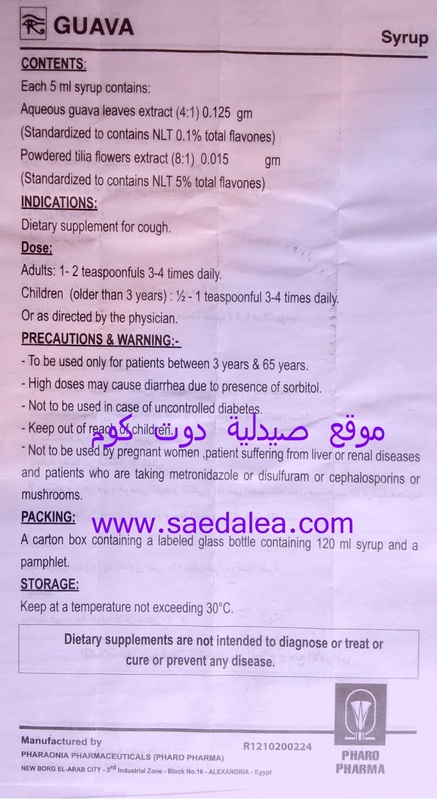 - High doses may cause diarrhea due to presence of sorbitol. - Not to be used in case of uncontrolled diabetes. - Keep out of reach of children. 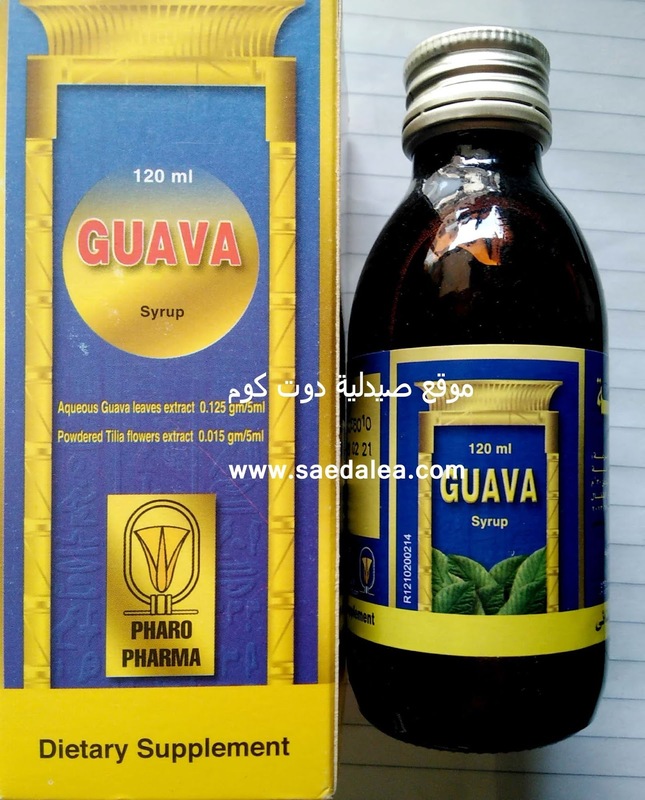 - Not to be used by pregnant women patient suffering from liver or renal diseases and patients who are taking metronidazole or disulfuram or cephalosporins or mushrooms. PACKING: A carton box containing a labeled glass bottle containing 120 ml syrup and a pamphlet. STORAGE: Keep at a temperature not exceeding 30°C.